I'm here writing up my February Blainletter and how nice it is to turn on the radio and hear John Valenteyn promoting my Campfire Jam on Saturday – He just played a track by Emily Burgess, who will be guesting. Thanks JV (and everybody should listen to John Valenteyn's Blues on CIUT 89.5 Thursdays at 4pm). It's been cold and miserable and I haven't been getting out as much, not to see other bands or even for gigs of my own, but my old stand-by, The Campfire Jam at the Old Mill is still going strong. Magloire Depatie (1864-1915) and Josephine Charron (1857-1912) . If you are acquainted/related to either of these folks, let me know. As opposed to most ancestry-freaks who are digging back in time, I'm looking forward from the great-grandparents to the grandparents then the parent who would be my birth parent. Fascinating. Still getting the new .com website presentable – the A/B audio player is finally working but I have to get it installed on all the tracks. It's kinda cool to be able to switch back and forth between the original solo live recording and the "sweetened" version. I also created a "Campfire" page with pics & vids from the campfire jams over the years and a little history. 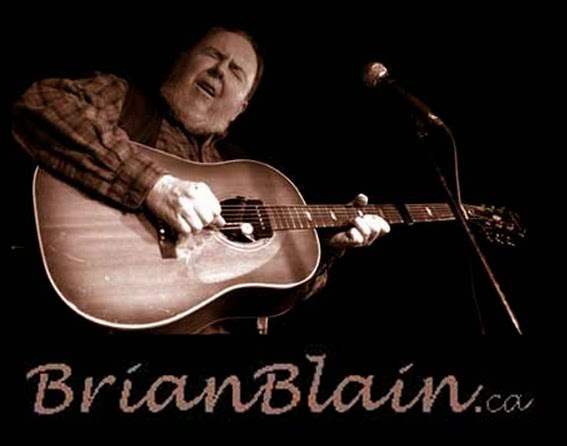 Check out www.brianblain.com/campfire and next I'm going to make a page with some of my explorations in electronica (aka, The Stringbuster). After getting away from it for a while, I just had another round and I believe I will rassle this beast ultimately. I just might need a little more processing power. Had a nice little jam with my son the DJ and nothing blew up (or locked up). That bodes well for future collaboration. The Maple Blues Awards was a big night – great to see Colin James jamming it up on stage with Steve Marriner. Colin took home awards for Electric Act of the Year, Recording/Producer of the Year and Guitarist of the Year. Harrison Kennedy won Songwriter of the Year and I got to meet Victoria’s hot new guitarslinger Jason Buie who won New Artist of the Year. I might not have met him had it not been for an internet scam that spoofed a few people into signing up for a webcast (there was no webcast) of the awards and giving out their credit card info (and then having to cancel the cards). It was some friends and relatives of Jason who got burned so we were trying to get to the bottom of it. Unfortunately there was not much to be done – but stay away from an outfit called "musiclivestream" The complete list of winners is available here. Booking a Festival: Don't send attachments (MP3s or otherwise). Offer links to 2 or 3 recent video clips with decent sound - preferably in asetting similar to the one you're pitching. They love it when the video shows a great crowd reaction. The single best way to get a gig is to be recommended by another festival director or "influencer." Getting a Grant: FACTOR has a 2k grant that seems quite approachable and a quarter of the applicants receive it. I might try for it but the deadline is only a week away! And grant expert Barbara Isherwood advises that you to give yourself plenty of lead time. Well, maybe not this time. It seems to be important to have a "team". Oh well, that leaves me out. For their purposes, an album is at least 6 songs or 20 minuts. And what do you know...FACTOR doesn't require a budget anymore. That was the part that always confounded me. Though I'm sure they're still sticky about receipts. Social Media: Facebook is changing their algorithms so that you will mostly see posts from your family and friends. It is worth it to spend a few bucks to "boost" your post but space it out over a period of time - don't spend it all at once. When you have an opportunity to put some keywords, put the names of artists whose crowd you would like to appeal to. And back to webcasts, I watched the "pre-broadcast" of the Grammys on my laptop and it was fine resolution and no disruption. The production values were comparable to the big show on Sunday – Paul Schaffer had put together a killer band. There was even a live performance by Taj Mahal and Keb 'Mo'– a nice contrast with all the slick production numbers. You might even say it had a "meandering" quality :-) Taj and Keb' Mo' got the Grammy for Best Contemporary Blues Album. Good on 'em! But I was rooting for "Migration Blues" by Eric Bibb (which was nominated for a Grammy this year). Michael Jerome Browne figures prominently on that album and he even got Eric Bibb up to his favourite studio…in my hometown, Sherbrooke, Quebec. Somebody told me Michael wouldn't be going down for the Grammy gala because he knew they didn't have a chance against the Rolling Stones – and, sure enough the Stones did win the award…and didn't even send someone to pick it up. Besides, the tickets were a fortune and even nominee tickets were prohibitive. I see MJB has a nice tour of UK coming up with Eric – two of my favourite musicians! A nice batch of Canadian Blues! "I have never in my life made music for money or fame. Not even Thriller. No way. God walks out of the room when you’re thinking about money." "The greatest singer in the world cannot save a bad song. I learned that 50 years ago, and it’s the single greatest lesson I ever learned as a producer. If you don’t have a great song, it doesn’t matter what else you put around it." And on the repetitiveness of rap: " The ear has to have the melody groomed for it; you have to keep the ear candy going because the mind turns off when the music doesn’t change. Music is strange that way. You’ve got to keep the ear busy."